Corsica has no lack of accommodation: anything from inexpensive campsites to luxury "Les Collectionneurs", "Châteaux & Hôtels Collection", "Boutique Hôtel" ... everyone should find something to their liking. However, finding a room or a campsite in popular tourist areas at the last minute in July and August, or even September, can be quite a challenge. 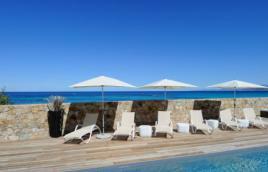 This page “Accommodation in Corsica” includes all the accommodation providers (von mir!) in Corsica who are members of our web portal "GO-TO-CORSICA.COM" with hundreds of links to lists of hotels in southern Corsica and to hotels in Upper Corsica for all those who want to stay in a hotel during their holiday, and lists of residences in southern Corsica and residences in Upper Corsica as well as rentals in southern Corsica and rentals in Upper Corsica for all those who prefer to have home holidays, but also campsites in southern Corsica and campsites in Upper Corsica for all nature lovers. In these lists you will find accommodation in Corsica for your holidays according to the desired category, i.e 1 star accommodation in Corsica, 2 star accommodation in Corsica, 3 star accommodation in Corsica, 4 star accommodation in Corsica and 5 star accommodation in Corsica. This accommodation in all of Corsica is either in Central Corsica, i.e. accommodation in the mountains for nature and sports holidays, or accommodation by the sea for seaside or sports holidays. Please note that this is not a selection, but only a small list of available accommodation, and the accommodation providers who only have a few pages and one address with a reservation agency are not directly mentioned. If an accommodation is missing, this means that they do not have their own website or they haven’t sent it to us. 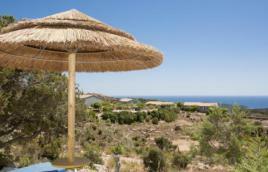 In a rural setting 4km from Bonifacio and 2km from the beaches. 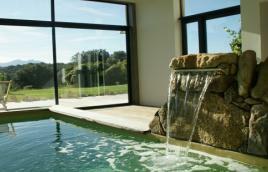 A place of relaxation and tranquillity ! 2 and 3-room apartments with sea and maquis view, all amenities, swimming pool. Ideal place to get away from it all and relax! 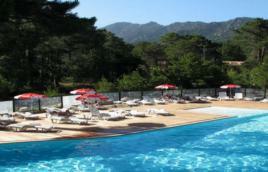 Between sea and mountains, on the shady banks of a river, swimming pool with waterslide, food and drink on site, bungalows.